IS IT POSSIBLE TO TRAVEL ROUND THE 10 GREATER MANCHESTER DISTRICTS IN ONE DAY? This idea came to me when I was half asleep early on Wednesday morning, and I decided, on the spur of the moment, to go and find out. By car? No, better to go by train and tram. More topical and "ecologically sound". We've got from 9.30am, when the cheap day fares start, till around 6.30pm when the light has faded. 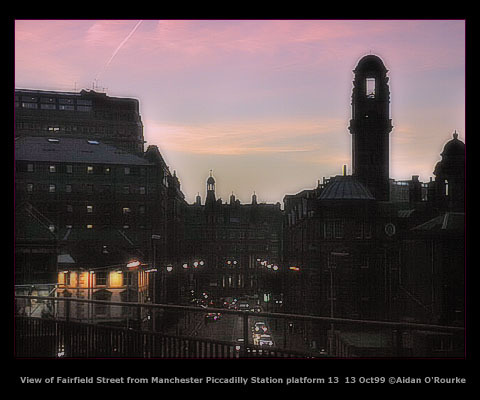 PICCADILLY is our starting point, and Radcliffe is our first destination - I've never been there before and I'd like to take some pictures there. 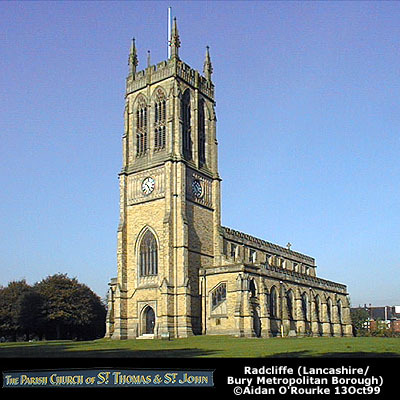 Radcliffe is about ten miles north of the city centre in the Metropolitan Borough of Bury. 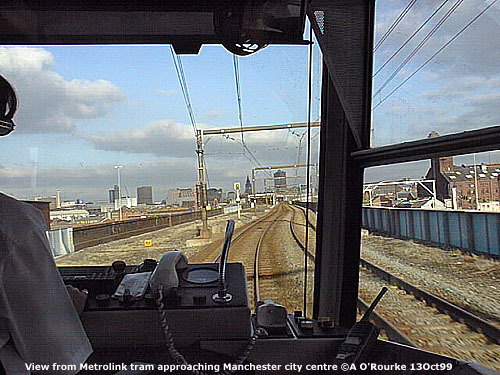 It's an easy journey with the Metrolink from Piccadilly Gardens. Buying a ticket I encounter my first problem - the machine doesn't take notes. After going to the bank for change, I return and buy a £3 Metromax ticket, which gives unlimited access to all lines for the day - 9.30am onwards. 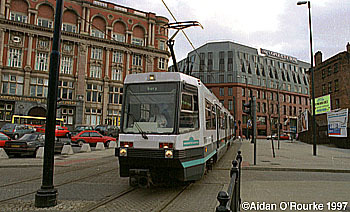 It's now 9.50 and the tram takes us through the city centre, via Victoria Station and up through north Manchester. 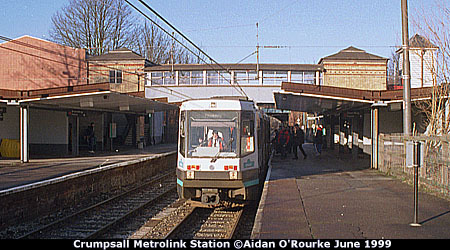 It passes through Crumpsall, Bowker Vale, under Heaton Park, then Prestwich, and over the M60, past Whitefield. Much of the line is in a cutting and we can't see very much, but soon we come out into the open again, cross a viaduct over the Irwell and arrive at Radcliffe, where we get off. The town is a 10 minute walk away. At this time in the morning Radcliffe town centre is quiet - very quiet. There's a small shopping centre, a bus station, the river, an old cinema - now a Kwik Save supermarket - a small clock tower showing the wrong time... Let's walk up to the church on the hill - the main landmark - where I take some photos and then head back to the station. On the way I see a nice view of the viaduct, with a tram crossing over it. At the station we don't have long to wait before another tram arrives. There are plenty of people on board as we speed south back into the city centre. THE ARNDALE CENTRE CAR PARK is one of my favourite city centre vantage points, with great views of the Metrolink trams as they make their way along High Street. From this height they almost look like toys, and we can see for miles - Oldham to the north east and Salford to the west are clearly visible. So where next? WIGAN. It's another place I haven't visited or photographed properly so far, so we hop on the tram back to Victoria Station. At the old-fashioned wooden booking window, I buy a Day Ranger ticket for £2.35. We pause to look at the old route map of the Lancashire and Yorkshire railway next to the booking office. Looking at the tangled mass of lines, I can't help feeling that todays' train system is a pale shadow of what it used to be. One look at our train to Wigan confirms this suspicion: It's one of those cheap and functional diesel railcars, with bus-like seats and very basic interior fittings. They've been running around 20 years now, and for many people are one reason among many why they don't want to take the train. 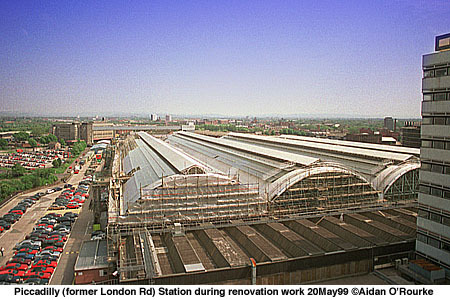 THE WESTERN HALF OF VICTORIA STATION HAS BEEN MODERNISED as part of the construction of the Nynex, now the Manchester Evening News Arena. But what was once the longest platform in Europe, linking Victoria and Exchange stations, now ends at Victoria. Exchange disappeared 25 years ago and the land became a car park. The only evidence of the once busy station is the cast iron disused footbridge which stands like a sad monument to times gone by. I remember crossing this footbridge in 1965 with my mother and father to take a steam train to Holyhead. 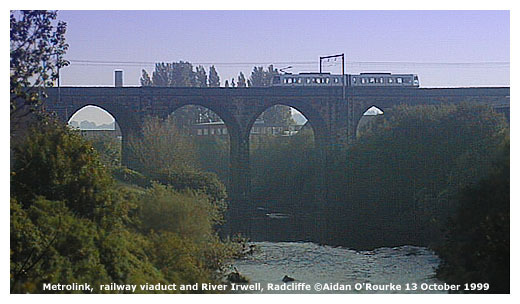 OUR RAILCAR - I HESITATE TO CALL IT A TRAIN - TAKES US OUT through Salford and up by industrial plants, many derelict, along the Irwell valley. This was once an area of mining - Agecroft power station stood here until recently - now the site is empty. A recent addition is a new prison - I don't think it's open yet. 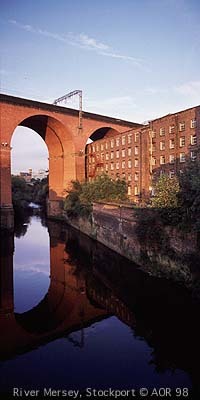 At Clifton, we see a disused branch line going off to the eerie viaduct that leads back across the River Irwell to Radcliffe. No trains have crossed here for over a quarter of a century. At Ringley we pass a new power station, radiating high voltage cables, and soon we're in Bolton. The train stops briefly, and we continue west to Wigan. At Lostock Junction we pass one of the red lights, scene of recently publicised "SPAD" incidents - Signal Passed At Danger - a term we've become very familiar with since the horrific train crash in London. The line comes out onto an embankment, with views over flat countryside - once mining country. Soon we're in the outskirts of Wigan. WIGAN WALLGATE is where we get off. It's just near Wigan North Western, the neighbouring station on the main West Coast Line between London and Scotland. Here in Wigan we're 18 miles (30km) west north west of Manchester, half way to Liverpool, but still in Greater Manchester. Wigan Wallgate Station retains much of its character, but has become rather run down again since the last renovation in 1978. It's ideally situtated close to Wigan's very impressive town centre, with its ancient church, arcades and attractive new shopping centre. It would be nice to stay longer, but we've got got to get back for the 1.10 train to Manchester, getting off at Walkden, another area I haven't photographed. We arrive at 1.11 and it's already gone. My bad timekeeping is costing us precious minutes. The next train is at 1.30 and goes via Bolton. We'll take that one and go to Walkden another day. On the dot of 1.30 we're on our way out of Wigan, going back along the embankment. The line is very uneven, the wheels make a very loud clickety clack, and the train rocks up and down. 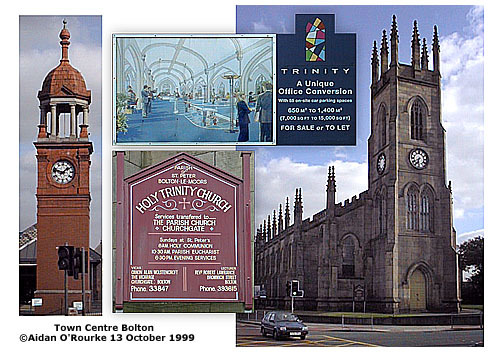 BOLTON STATION is a little further away from the town centre, so I photograph the two main landmarks outside - the clock tower and Trinity Church, soon to be converted into offices. Now it's decision time - north or south? From Bolton station, trains go through south east through the city centre and north east to Oldham and Rochdale, as well as south east to Stockport and Manchester Airport - Let's go to Oldham! We get on the 2.05, which soon departs. 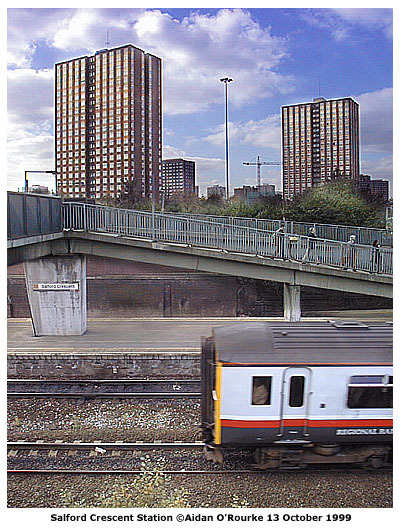 On the way back down through Kearsley and Clifton, I realise I still need a photo of Salford, so we get out at Salford Crescent, which is just next to Broad St, under the shadow of the red brick high rise block where I once lived. 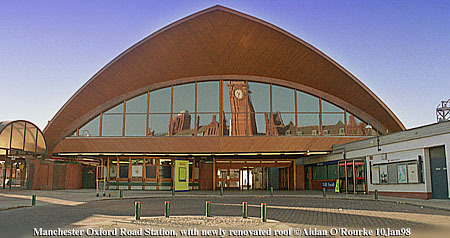 Salford Crescent station was created when the so-called Windsor Link was opened in the 1980's, joining up Manchester's northern and southern rail systems, allowing trains to cross Manchester from north west to south east. Salford Crescent is the station for Salford University and sure enough, there are plenty of students here. STOCKPORT STATION has recently been refurbished and painted in two tone colours - blue and green on the southbound platforms, blue and yellow on the northbound side. London Euston is 186 miles (300km) south east of here, two and a half hours by Virgin Trains which run every hour through the day. A delayed Virgin train from Aberdeen to Plymouth approaches us along the viaduct and enters the station. Aberdeen to Plymouth - that's a very long journey indeed - by British standards at least. But for today we'll stay inside Greater Manchester, and go to another GM district. So which one? 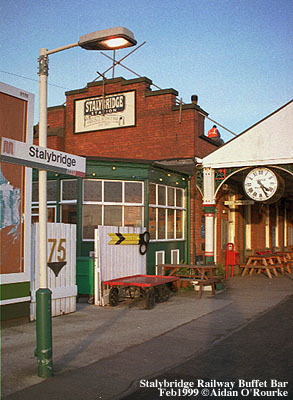 We could go to Stalybridge in Tameside, but as the train operates just once a week on a Friday evening, that's not an option, so our next destination will be Altrincham, in the Borough of Trafford. 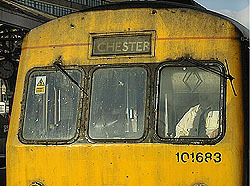 We'll take the Chester train, departing 3.33. While we're waiting, let's take a short walk towards the town centre - a good 10 to 15 minutes down the hill. Thirty years ago the site next to the station was a coal yard - I remember it from my childhood - I went to primary school near here. Now it's Grand Central, an American-style leisure village, with MacDonalds, Virgin Cinemas, Army recruitment office, youth centre, pool hall and swimming pools. Wellington Road is mostly the same, apart from the missing Essoldo Cinema. 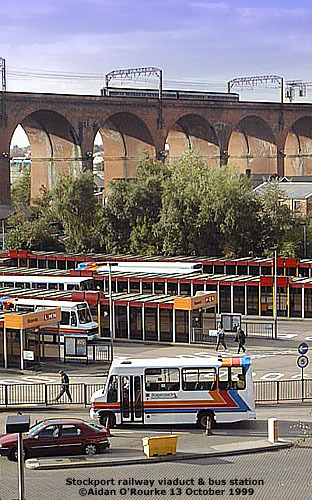 From Wellington Road South we have a view over the bus station towards the magnificent 1842 viaduct. But we don't want to miss our train, so let's get back to the station. 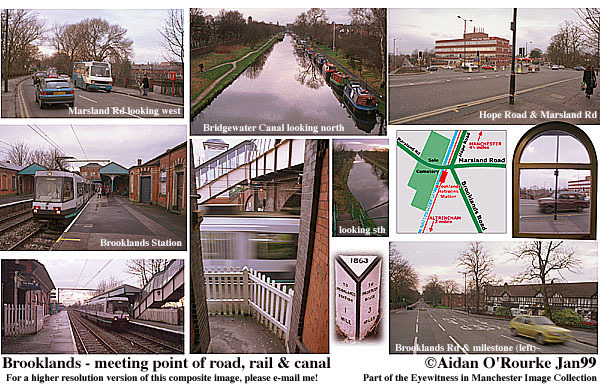 STOCKPORT has for nearly 10 years been linked to Altrincham via a former freight-only line. 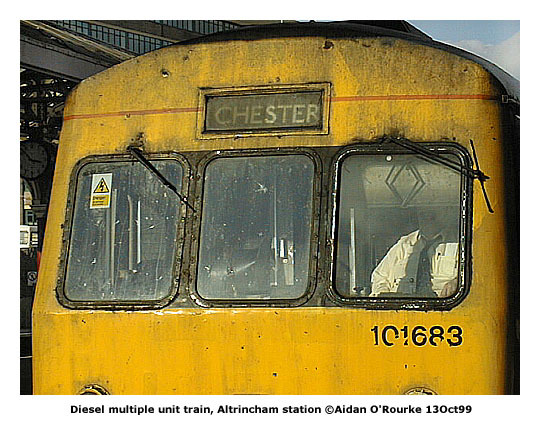 Trains to Chester do a detour via Stockport - This is because the former Altrincham to Manchester line was converted for use by the Metrolink, which was opened in 1992. THE CHESTER TRAIN departs on time, and takes us off down a branch line, behind Stockport County football ground and out through Cheadle Heath, where I grew up. On this train I can pull the window down and as I look out, I see the houses, streets, gardens and allotments which were my playground as a child. The line crosses the former London Midland line at Cheadle Heath. 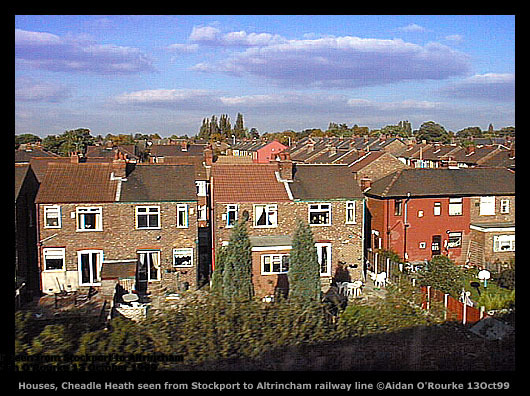 My father worked for a while at Cheadle Heath station, and used to go to the nearby Railway Club. Hello Aidan, I've just finished reading through your Train and Tram journey, which I have enjoyed immensely. Travelling by train is something which I have always enjoyed and another thing I miss living in Australia. There are just three train lines here in Perth and another which goes from Perth to Sydney. Unfortunately, you have to take out a mortgage to go on this 3 day journey. Isn't it strange that trains seem to be a part of most English people's childhood? 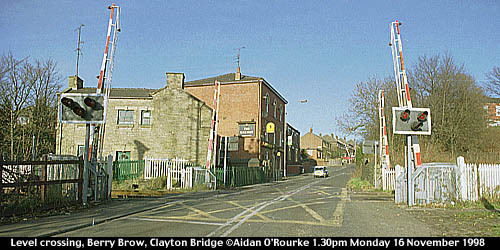 We had a railway bridge at the end of our street and my dad used to take me to watch the trains go under. I can still smell the smoke to this day. 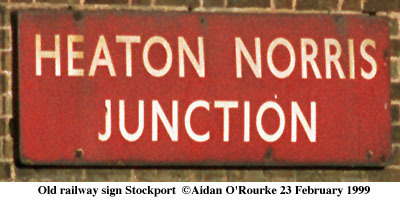 I seem to remember a film being made at Newton Heath station (does it still exist? ), starring Arthur Askey - now that dates me doesn't it? I think they used that particular station because it had a turntable. Looking forward to your next journey. Glad you liked this feature - I can remember the smell and sound of the steam engines too, but it seems like another world now. Continuing through Cheadle and Wythenshawe, the train picks up some speed, as there is no station between Stockport and Altrincham apart from Navigation Road, where we soon arrive. 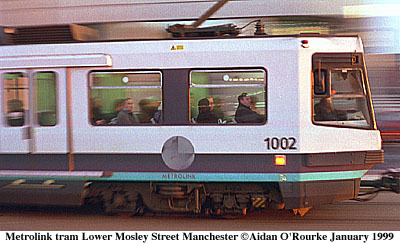 On the short stretch between Navigation Road and Altrincham, trams and trains use the same tracks. ALTRINCHAM is busy - it's school finishing time and the bus station is full of children on their way home. 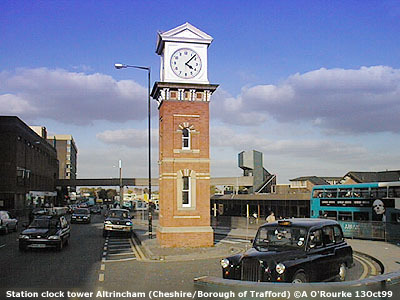 I used to live in Altrincham. It's pleasant and quite affluent, but finding a good photographic subject here in the town centre isn't easy. 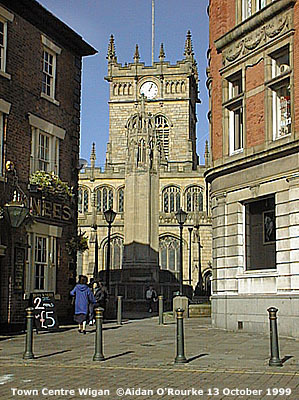 Interesting to compare the clock tower here with the one in Bolton. IT'S PAST FOUR O'CLOCK as we board a Metrolink tram full of schoolkids, and I thank my lucky stars I'm no longer a teacher. We head north east on the long straight line through Timperley, Sale, Stretford and Old Trafford into Manchester. I'm sitting on the front seat and looking over the driver's shoulder. I like the way she waves at her fellow Metrolink drivers coming in the other direction. You get the impression of a close-knit dedicated team. She announces each station as we approach it. 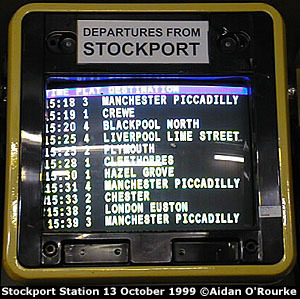 "Next station Stretford. Passengers travelling to the Trafford Centre can take the shuttle bus". "Passenger" - now that's a word you won't hear on the railways. Since commercialisation and later privatisation, rail bosses have insisted on calling us "customers". I find this usage symptomatic of everything that's gone wrong with the railways. A new logo and a lick of paint can't hide the fact that our once proud railway system has been under-funded for many years, and hearing the word "customer" is a constant reminder of our dissatisfaction. We are travelling from A to B, for goodness sake, not shopping for groceries. The sooner they follow Metrolink's example and start calling us "passengers' again, the better. WITH SALFORD QUAYS on the left, we're passing the new Metrolink station at Cornbrook. We've done seven Greater Manchester districts, but still have three more to go. Are we going to make it by six thirty? From Victoria Station we can travel to Oldham and Rochdale - that's two - but there's still Tameside and it's nearly half past four. We'll stay on the tram until Victoria Station and see what happens. AT VICTORIA STATION it's decision time: The timetable says there's a train to Rochdale via Castleton at three minutes past five. Should we take it? OK, let's take it, but checking on the display, I see it's been cancelled. 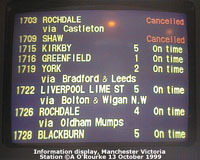 We could take the 1709 to Shaw, between Oldham and Rochdale, but soon that one is showing "cancelled" too. Shortly after, the Shaw train is reinstated, but it's too late now, we've "timed out" as far as Oldham and Rochdale are concerned. We're going to have to leave it till another day. We can still make it to Tameside though, by taking a Huddersfield train via Ashton and getting off at Stalybridge. From there we can travel back on another line to Piccadilly station, completing our journey for the day. The 5.15 to Mossley is standing on platform one. As we sit on the train waiting expectantly, there's a mumbled annoucement that the train is going to be late. The driver doesn't seem very certain how long: "It might leave in the next couple of minutes" he tells me. Along with most of the "customers", I get off, walk to the end of the platform, turn round and... it's gone. But there's another train to Stalybridge from platform 5, so it's back over the bridge. TWO SETS OF PASSENGERS cram onto one train, and the box on wheels is getting more like a sardine can on wheels as it accelerates slowly out of Victoria and climbs the gentle slope north east and then east through Collyhurst, crossing Oldham Road and heading east by Philips Park, the Velodrome and Commonwealth Games site. Here again, the view out the window is of a once great railway system that has been allowed to wither away to a skeleton. Weeds have taken the over ghostly, deserted platforms of stations no longer in use, only two tracks run where there used to be four. In the fading light, we see the branch line to Ashburys now used only by the occasional freight train. In 1963, the Beeching Report recommended the axing of the majority of Britain's rail network. 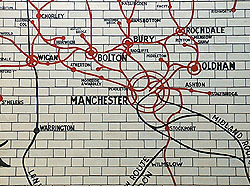 Two of Manchester's four main rail stations were closed, and the less important branch lines were amputated from the system. 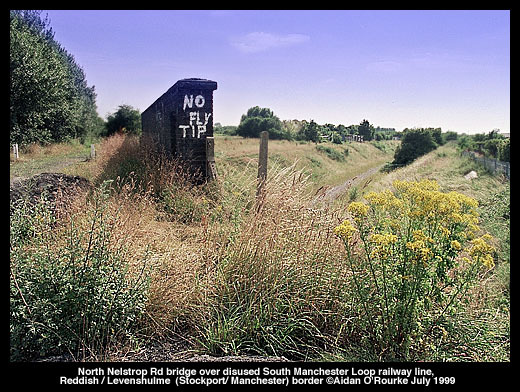 Disused railway lines, with only gravel where there used to be tracks, criss cross the region all around Manchester like scars that have never fully healed. Doctor Beeching was probably right to close many tiny branch lines in remote parts of the country, but it's now accepted many other lines could have been kept. In 1999, as the roads become more and more congested with cars, it would be great if we still had those railway lines, now fully renovated and running superb, exciting, state of the art, trains. But it's back to reality with a jolt, as the packed railcar rounds a bend and I hang on to the handrail for dear life. Looking out the window here, we can see some small signs of renewal - down by the side of the track, I see that new signalling cables have recently been installed. Only recently the old-fashioned signals were taken down. Going alont by Clayton Vale, we seem to be picking up speed, but then the train comes to a grinding halt. We have stopped just short of Berry Brow level crossing, Clayton Bridge, and up ahead I can see cars crossing the line - I thought that they were supposed to stop for us, not the other way round! 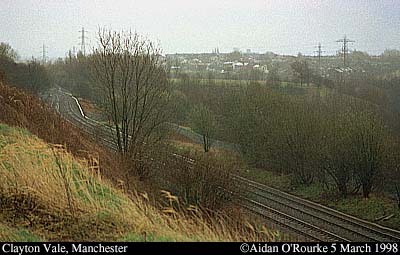 After continuing along the Medlock valley, and crossing over the M60 construction site, the train pulls into Ashton, and many of the commuters struggle off. 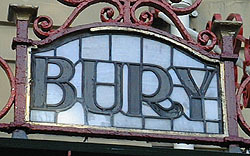 We continue past Ashton, and onto the line from Piccadilly to Huddersfield, via Stalybridge where we get off. This once busy and important station nowadays looks mostly deserted. 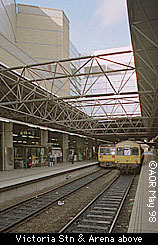 Like Bolton, it's a station that's bigger than it should be - the two platforms are very wide - separated by space for four tracks where there are now only two. An announcement comes on saying at train to Piccadilly is about to arrive. I have just enough time to race through the tunnel and across to the other platform and take a romantic sunset by the mill chimney. It's about ten past six. Unfortunately, there isn't enough time for tea and biscuits - or something stronger - at the excellent Station Buffet Bar over on the other side. 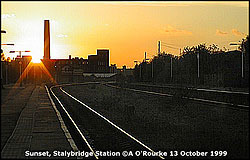 Aidan - I enjoyed your train and tram tour, loved the sunset over Stalybridge. GETTING ON THIS TRANSPENNINE TRAIN, I'm struck by how plush, comfortable - and empty it is. Local rush-hour commuters on the Yorkshire side of the Pennines have got off and for us, now it's just a short journey into Manchester. The lighting is subtle, the ride is smooth, the seats are welcoming, there's a premium class section... Now why can't all trains be like this? Cocooned in this comfortable environment, and in the fading light you almost don't notice the dereliction of Guide Bridge and Gorton stations outside. It's about six thirty as we speed through the renovated Ashburys station and pass Ardwick junction, just a mile or so south of Piccadilly. AT PICCADILLY STATION we reach the end of our journey and after all the decay and dereliction we've witnessed today, it's reassuring to discover the superb renovation job that Railtrack have carried out on this, Manchester's second oldest railway terminus (The oldest one - in Manchester and in the world - is the 1830 station on Liverpool Road). A newly installed glass and steel roof looks bright and ultra-modern, but retains the essential character of the impressive 1842 train shed. And for the first time, I can see the city through the windows at the top end of the station - that's the tower of the City Police Courts, Minshull Street, and Portland Tower is visible over to the left. WELL, AFTER A JOURNEY OF OVER 100 MILES, IT'S TIME TO GO HOME. Join me again when it's sunny - in a few days I hope - when we will complete our whistle-stop tour on rails of the 10 Greater Manchester districts. Bye for now.